They sat quietly, leaning toward the lectern in a dark-paneled room near Lake Calhoun, Minn., as a professor from New York told of his encounter with one of the mysterious Men in Black. In the audience were people such as biophysicist Otto Schmitt, a retired professor of electrical engineering at the University of Minnesota; retired aircraft developer and physicist Cecil Behringer; physician Steven Zuckerman and polymer scientist Arthur Coury. Peter Rojcewicz told them there have been hundreds – perhaps thousands – of such encounters over the centuries. “The Men in Black are part of the extraordinary encounter continuum – fairies, monsters, ETs, energy forms, flying saucers, flaming crosses,” said Rojcewicz, a 37-year-old professor of humanities and folklore at New York’s Juilliard School. The modern era of Men in Black – visitations by mysterious, black-clad men who seem evil and threatening – goes back to at least the early 1950s when a man named Albert Bender reported seeing a UFO in Bridgeport, Conn., and was later frightened by a visit from three Men in Black. Rojcewicz told the audience that his own MIB (Men in Black) experience occurred in 1980. “I have never gone public with this before,” he said. 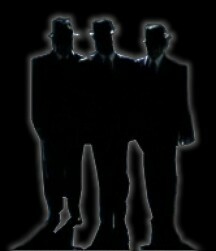 Most of the modern era MIB encounters have followed sightings of UFOs or strange lights. Rojcewicz’s encounter involved no sightings. He said he was just sitting in the University of Pennsylvania library, reading a UFO book suggested by another professor who thought that Rojcewicz would be interested in such phenomena. “Then in the corner of my vision I noticed a black pants leg and a black shoe, scuffed,” Rojcewicz said. Standing in front of him, Rojcewicz said, was a very gaunt, very pale man. He wore a black suit, black shoes, black string tie and a bright white shirt. Rojcewicz told the man he didn’t know much about flying saucers and wasn’t sure he was very interested in the phenomena. “I tried to calm him,” Rojcewicz said. The man got up, once again all in a single awkward movement, put his hand on Rojcewicz’s shoulder and said: “Go well on your purpose” and left. Rojcewicz said he thinks his experience – and that of others who have been exposed to the Men in Black – are somewhere “in the crack” between real life and fantasy. He has been studying anomalous phenomena such as the Men in Black ever since his 1980 experience. He has interviewed many people who have reported UFOs, flying saucers and Men in Black experiences.